1. Cross Equatorial Winds: Perfect winds. SE to SW after crossing the Equator...But..In the Bay Branch. 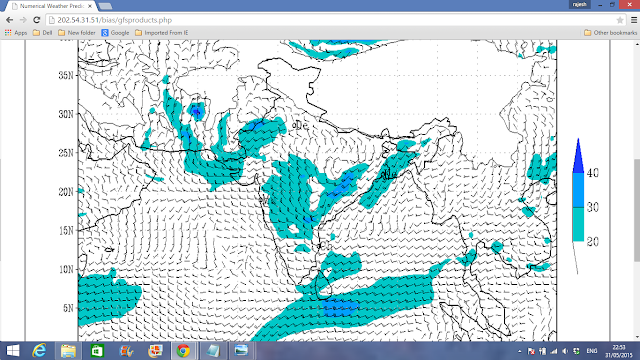 See the winds going as per required pattern, and gushing over Northern Sri Lanka at over 35 knts . Thus Heralding the South West Monsoon advance over complete Sri Lanka in 24 hrs. As the SW winds height is not sufficient for strength, the current will be feeble. 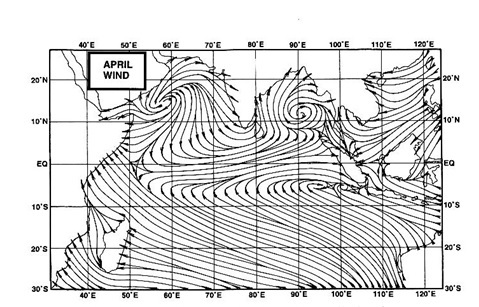 In the Arabian Sea branch, the equator crossing is in shape, but the High pressure in the Arabian Sea diverts the winds towards N, and then re curve Clockwise as NW winds along the West Coast of India. 2. The 200 Jet Streams, now of Prime Importance to guide the Monsoon, are fully "in place", as Easterlies, over Sri Lanka and extreme Southern India around 10N. Getting to Easterly direction below the 15N line in a week's time. 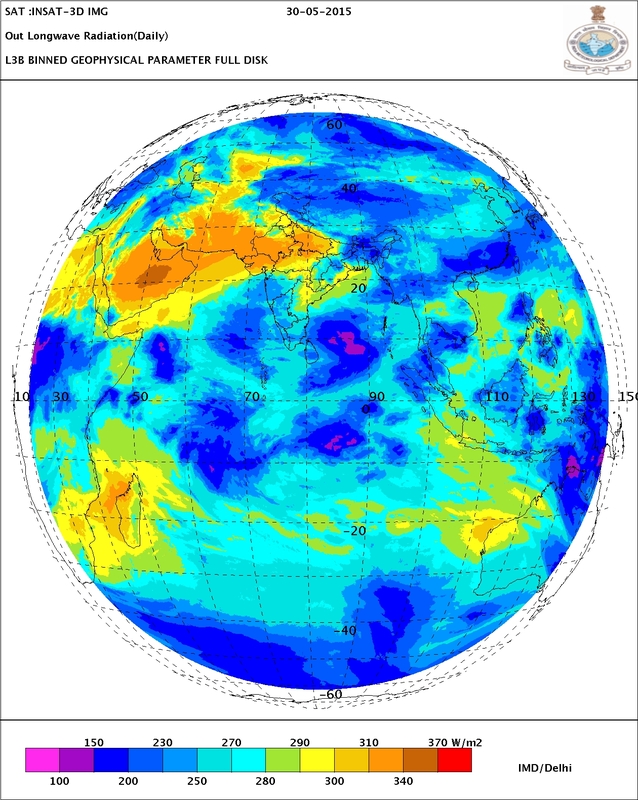 3.OLR and corresponding MJO are gradually setting favourably now. 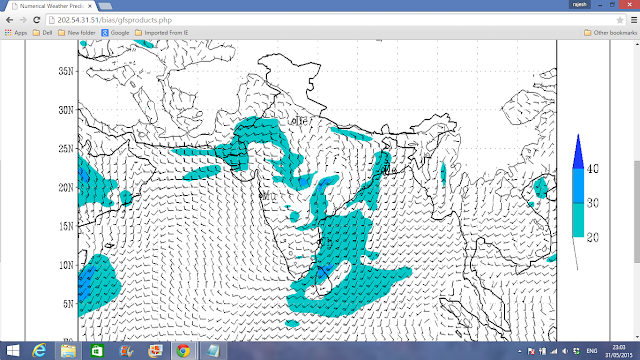 A Low Pressure (AS-1) is likely to form in the South East Arabian Sea, off the Karnataka Coast around 4th/5th June. Initially at around 1000/1002 mb. It is likely to become Well Marked to 998 mb by 6th/7th June, and track N/NW upto 15N. Then, it seems, it may dis engage itself from the trough, and possibly fizzle out in the Sea. AS-1 is not likely to effect the Monsoon Onset dates as estimated by Vagaries. Monsoon to advance into Northern and complete Sri Lanka on 1st June. Likely progress into Kerala and South Lakshdweep by 4th June. Sir,is the UAC fizzling out near AP coast. As per some international module arabian sea depression travelled wnw direction and touch yemen coast or oman as per ur view fizzle out in sea but it wil adversely effect on progress of monsoon in west coast.same thnig happend in last year.this year picture also not looking good. Pradeep: Appreciate your observation...but remember, what i always say...NEVER go on any one forecast model or any one chart. Chart of same time and same place will vary in different plottings. Use your own judgement and come to a conclusion. And again, remember, these models will change at the snap of a finger. Vagaries gives its views as deduced by itself.